What are the secrets that let people enable to have great accomplishments? How they surviving while situation is worst? If you spend 80% of your time focusing on the problem and only 20% on the solution what do you think is going to happen? It’s easy to complain. It’s easy to be a defeatist. You need to make it. Spend your time trying different solutions. No matter what your problem is, whether it's job or business problems, health issues, fear or anything else that blocks your success, you can turn your negative into a positive. No matter how tough times get, you have the great potential to achieve the best of life. The difference between those who win and those who don’t is the application of the powerful concept of ‘Possibility Thinking’. Winners dare to dream. They commit themselves to it. They dare to try, to take the risk. They believe ‘If it’s going to be, it’s up to me’. They understand that a failure is an event, not a person. They never quit. They turn dreams into success, setbacks into new beginnings, and successes into newer possibilities. So get ready for new ventures and seize it. Do It now. Stay motivated. 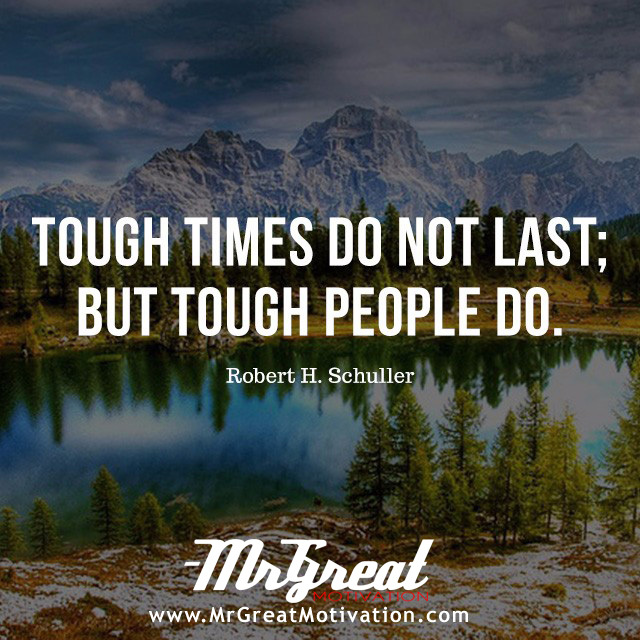 We hope guys you find Quote "Tough Times Never Last, but Tough People Do! - Robert H. Schuller" by Mr Great Motivations useful. If you think we have made some efforts, then don't forgot to appreciate us by sharing this Quote with your friends and family, And thanks for visiting.